My Persephone Biannually arrived on Friday. Now, I know I’m not the only one who rejoices when they spot that envelope amidst the rest of the mail but there is something particularly cheering about it arriving on a Friday when you know you have the entire weekend to savour it. I didn’t cosy up with my biannually until Saturday night but it was far from the only Persephone reading I did this weekend. I had quite a little Persephone celebration on my own. I read The Wise Virgins by Leonard Woolf on Friday and also dipped in and out of It’s Hard to Be Hip Over Thirty by Judith Viorst before bed that night, consumed The Priory by Dorothy Whipple on Saturday evening and rounded off the weekend with Operation Heartbreak by Duff Cooper on Sunday. Leonard Woolf and I have a few issues we need to work out between ourselves, but Operation Heartbreak was predictably heart-wringing and I adored The Priory. Now all I want to do is read through the rest of my Persephone collection and, of course, expand it. My Christmas list is already half-filled with Persephone titles and I am incredibly excited about the two titles they will be printing in the spring: Heat Lightning by Helen Hull and The Exiles Return by Elisabeth de Waal. Do you remember how and when you discovered Persephone Books? What are your favourite titles? I had never heard of them until I started reading blogs this past year. They certainly are an interesting publisher though hard to get in Australia due to the postage. I noticed our state library doesn’t know of them. I enjoy hearing about them though. Pam, Gemma’s tip below about ordering through Book Depository is a great one. That’s how I’ve got all of my Persephone books, aside from the ones I picked up when I was in London last year, since the prices were so much more reasonable. I just had to comment on this post. 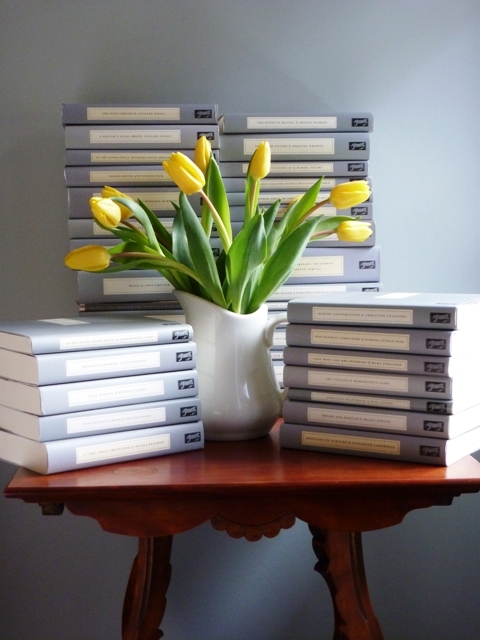 Your pictures are beautiful, and so very fitting for Persephone Books. Plus, one of them features Irisses so how could I not like it? 😉 (Seriously though, every year I want Irisses in my house at least once, we used to have them regularly around my birthday when I was a child, but it seems they’re not common here anymore, or at least not sold usually). I want to have my own Persephone weekend, thank you for the inspiration! How did you like The Wise Virgins? It was the first Persephone I read. I’m quite curious about the name Elisabeth de Waal, because it sounds so Dutch. But I assume that it’s actually a German author? I googled her but couldn’t find anything. I hope I receive a BIannual in the mail, perhaps it has a little more info. Actually, I think I’ve found her (possibly? ): http://bookhaven.stanford.edu/tag/elisabeth-de-waal/ Fled from Vienna and the nazis, settled in England with her Dutch husband.. and here I thought I had found the perfect book for next Dutch lit month 😉 Well, I’m sure the book will still be very good. Yep, sounds like that is her. All I know about her and the book is what I’ve read on the Persephone website: that Edmund de Waal is her grandson, that the book has never been printed before, and that it is about “four exiles’ return to Vienna a few years after the war”. That sounds very promising to me! I always pounce when I see iris for sale since, alongside tulips, they are my favourite flowers both in the garden and out. It seems bizarre to have spring flowers in the fall but as long as they keep flying them in from the southern hemisphere, I will keep buying them. They are just so pretty! I have mixed feelings about The Wise Virgins which I hope to eventually work out in a review. Everyone felt so young and I found Harry and Camilla so, so frustrating and silly…but I still liked the book. There is always something to think about with any Persephone and I think this is the perfect example of that. 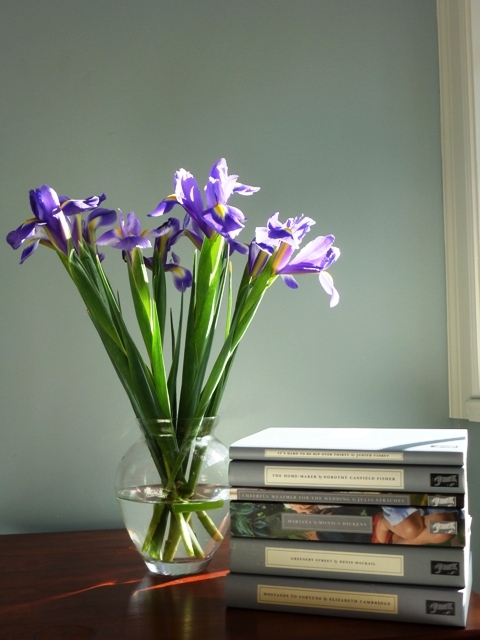 I found out about Persephone Books on Deanna Raybourn’s blog in 2011. I did not read many of their titles yet, so I can’t say which are my absolute favorite ones, but I really appreciated The Victorian Chaise-longue by Marghanita Laski and The Making of a Marchioness by Frances Hodgson Burnett. I am quite eager to read The Victorian Chaise-longue. It sounds so different from her other books and very, very interesting. The Making of a Marchioness is one of those books that everyone else seems to adore (like Miss Buncle’s Book) but which I loathed on my first reading. I really must give it another try and it should be interesting to see the ITV adaptation this Christmas! The Victorian Chaise-longue is chilling because of the feeling of entrapment, but what captured me most was the writing: I found it brilliant, Laski really played with words and characterization in a sort of specular way that reflects the structure of the story; and the ending is… woah! (Just my opinion, of course). I still have to read Miss Buncle’s Book, I’m very curious. I’m in Perth. I have bought a couple through Book Depository, and they’ve cost around $12. The “Classics” imprint is a little more, but still less than $20. Book Depository doesn’t charge postage. Great tip, Gemma! I do the same. Book Depository is amazing! Yes, I love Book Depository. Mind you I realised later I had them back to front. The “Classics” are the cheaper ones! Still they’re all worth it. I first heard about Persephone books when I was scouring the Internet looking for replacements for the wonderful Common Reader catalog–that was a few years before I started blogging. But it wasn’t until after I started blogging that I read my first Persephone title (Miss Pettigrew Lives for a Day). I’ve only read about a half-dozen titles, and I think my favorite so far is The Home-Maker, although Family Roundabout was quite good too. Isn’t the internet useful? It sometimes scares me to think how many wonderful books I would never otherwise have known about – not to mention how many wonderful people I would never have come into contact with! I think The Home-Maker is absolutely amazing – it is hands down the one Persephone I wish I could give to everyone I know, confident that they would all love it – and also really enjoyed Family Roundabout. I discovered Persephone over at Book Snob, where I also discovered you via Rachel. Good things happen over there, don’t they? I do get the biannual, it did come on Friday, I absorbed it on Saturday, and have my bookmark carefully placed in the queue for my next read, hopefully “The Madonnas of Leningrad”. My interest in the siege was piqued when your wrote about Anna Reid’s book earlier this year, leading me to say that good things happen right here as well. Good things do happen at Book Snob, indeed! I am excited to hear you’re planning to read The Madonnas of Leningrad. I read it shortly after it came out in paperback and really liked it. Until I read Anna Reid’s book, it was the basis of all of my knowledge about the seige and its a beautifully-told story. Hi Claire, what a wonderful post! Like you I learned about Persephone through a book blog and it was one of the inspirations for me to start my own blog. The concept of writing about the books that I loved and also places like Persephone inspired me to start a blog. One thing led to another as you know it does in the blogging world, and suddenly I was part of a literary blogosphere that felt like a community of kindred spirits. I visited Persephone when I was in London and bought several titles. I am now headed over to their website to see what they have planned for the 100th title! Happy anniversary to them and we are all happy you started a blog! It is so wonderful to hear your Persephone story, Sunday, and hear how similar it is to mine! For me, those bloggers I first learned about Persephone from are now some of my closest online friends and I am so happy to be in this little Persephone-loving corner of the ever-growing book blogging community. Enjoy your time on the Persephone website. It was recently redesigned and it is quite fun to go through and see all the changes – I love that the books are now divided up into thematic categories for browsing. I received the biannually this week too and was ecstatic. I discovered Persephone, like most, through book blogs. I only just this year, though, read my first one – The Blank Wall by Elisabeth Sanxay Holding – and loved it. I have bought about 5 others since then and your post has inspired me to pick one of those up this evening, perhaps The Home-Maker. I’ll say it again: the internet is SO useful! Especially, it seems, for Persephone marketing. And do, do, do pick up The Home-Maker. It is fabulous! Isn’t it lovely to go through a day knowing you have the biannually waiting for you? It is such a treat! I love your “I’m always ready to make a wishlist”. I started doing that as soon as other bloggers began posting about the Persephone 100. Except all too often list-making leads to action…I placed an order for three books this morning. I had told myself I wasn’t going to buy anything more until after Christmas. Whoops. I’ve also only discovered Persephone very recently, but got hooked immediately. One of my favorite books of the year (so far) is Tea with Mr. Rochester, a collection of wonderful short-stories by Frances Flowers. Have you read it? I haven’t read Tea with Mr Rochester yet, Alex, but I have been looking forward to it, which, for me, is quite a big deal since I’m not naturally drawn to short stories! I am so glad you have discovered Persephone and that you’re enjoying the books you’ve read so far. I actually discovered Persephone books through your blog! I had never heard of them before, but was interested enough to go snooping around to see what all the fuss was about. I haven’t ordered any of my own yet, mostly because of expense but just looked at the book depository website and am happy to see that they have the books for just over $20. The only Persephone I’ve read was Miss Pettigrew Lives for a Day, because my library had it. Joanne, I am delighted to have been the one to introduce you to Persephone! They have published so many wonderful books and I hope you have as much fun as I have had discovering your favourites.